Hey guys, we received a ton of awesome questions from members of the Open Sky Fitness Podcast Group on Facebook so today we’re taking the time to answer them for you. If you ever have a question or need help with something, you can always ask in the Facebook group and either we or someone in the group can help you out. Muscle rubs, creams, balms, and oil (cold, hot, herbal, Hanako, arnica, CBD/cannabis etc.) – How do they work? Are they actually good for the muscles? What are their benefits? How can I get over my fear of reinjury or injuring someone else during a workout, practice, or sporting event? What’s Rob’s favorite version of a classic exercise? Can CrossFit can be utilized in a normal strength training program? Are Nitric oxide boosters and pre-workout powders beneficial for strength and cardio training? What foods should we eat after a hard workout and how long should we wait to eat them? 4:00 The benefits of reaching out for help from someone like a business coach or personal coach to help make decisions and get unstuck. 6:30 Our one-on-one coaching services that are currently available to help you with your wellness journey. 8:30 Why you have to take care of your health first before helping other people. 10:20 First Question: Muscle rubs – Are they actually good for the muscles? What are their benefits? How do they work? 30:00 Second Question: How can I get over my fear of reinjury or injuring someone else during a workout, practice, or sporting event? 38:00 Rob’s favorite variations of classic exercises. 46:20 Can CrossFit can be utilized in a normal strength training program? 55:35 Are Nitric oxide boosters and pre-workout powders beneficial for strength and cardio training? 59:30 How to stay energized during a workout besides pre-workout powders and supplements. 1:00:00 Pros and cons of pre-workout supplements. 1:06:00 Protein shakes vs. food after a workout? 1:10:00 How to see if the protein shake or food is giving you the better result. 1:12:10 Contact Devon and I if you’re interested in one-on-one coaching with us. OSF 218 – Perfectionists vs. High Achievers: Which One Are You? One of the best things you can do for your mind and body in your mission to get healthier is to focus on your nutrition. That’s why we’re allowing people to sign up now to join us for our next Free 7 Day Paleo Rest! It’s all done via Facebook so no annoying emails that will fill up your inbox. We’ll be releasing new podcasts episodes on Thursdays that discuss previous episodes we’ve done, but we need your help! Go to the Open Sky Fitness Facebook Group and tell us what your favorite episodes are. Then, Devon and I will re-listen to that episode, pick out the best parts and share even more insights on the topic. We won’t just be regurgitating the same information over again. Since we began this podcast, there’s so much more information out their on health, nutrition, fitness, and personal wellness. So, each Thursday we’ll really just be going deeper into your favorite topics! That’s right! By listening to the Open Sky Fitness Podcast, you get the chance to get a free order of bacon plus $10 off your first ButcherBox purchase!! That’s right! We have a closed Open Sky Fitness Podcast group on Facebook where you and everyone have the opportunity to talk about your health and fitness goals in a safe environment. We post workouts and start discussions about how to be strategic about finding a healthier you. Check it out! Click To Download Home Workout Templates or text the word, “lifting,” to 33444 to download the templates. 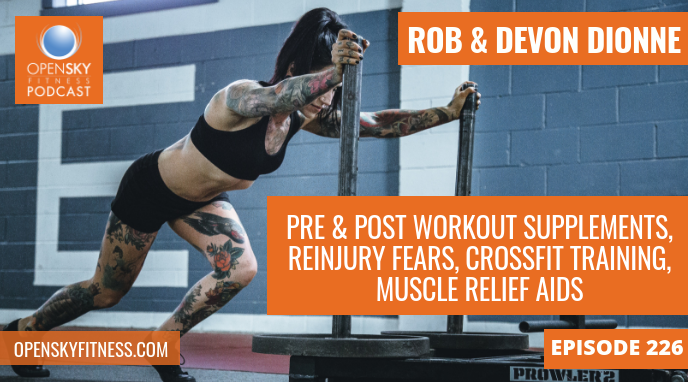 Thanks for listening/reading episode 226 – Pre & Post Workout Supplements, Reinjury Fears, CrossFit Training, Muscle Relief Aids! We hope you have gained more knowledge on how to be a healthier you.